Yeah, I know Cinco de Mayo was on Saturday, but really, salsa didn’t become America’s favorite condiment based on one barely-understood holiday’s consumption alone. (According to Jerry Seinfeld, it’s America’s favorite condiment because people like to say “SAAAALSAAA.”) The thing about salsa is that it is, hands down, one of the easiest things to make. I’m not kidding you, screwing up salsa is very, very hard to do. I almost never make it the same way twice, because I’m always playing around with what I have on hand, and salsa really just means “sauce,” so you can have fruity salsas and chunky salsas and very smooth salsas and salsas with cheese in them and oh gosh, some folks even say guacamole is a kind of salsa. My mind is bended! What I’m saying is, your salsa can go in a lot of different directions, and it’s easy to fix mistakes, particularly in a fresh salsa. I’m mainly a pico de gallo girl—those big chunks of tomato and onion really turn my crank—but a hand-chopped fresh salsa like that is admittedly not the best for chips. And chips, dear friends, are one way to make a casual hangout feel more like a party. My Papa makes a really delicious salsa cruda, and we always had a jar of it in our fridge at home, which I regularly plopped on some super-low-rent nachos and quesadillas when I got home from school. I think I once got in trouble for eating up one batch too quickly. I’ve fallen out of the habit of keeping homemade salsa around, but I think it’s time I bring it back. You can do it with me. This here is our salsa challenge. Let’s make salsa, friends! A mere ten minutes of work yields a vat that’ll feed the teeming millions. Don’t be scared of the yield. You can spoon it over grilled chicken or fish, tuck it into burritos or tacos, stir it into soups or beans, add it to the liquid when cooking rice, plop it on top of eggs or a baked potato…and of course, it pairs beautifully with all kinds of chips. (24 hours after I made this salsa, we had only a cup left.) Since I use canned tomatoes here, it can be made in any season and you’ll escape the menace of mealy, sad, pink tomatoes. Also, heat makes tomatoes even healthier; canned tomatoes give you more lycopene than fresh ones. Eat up! What’s your favorite way to eat salsa? Are you a purist? 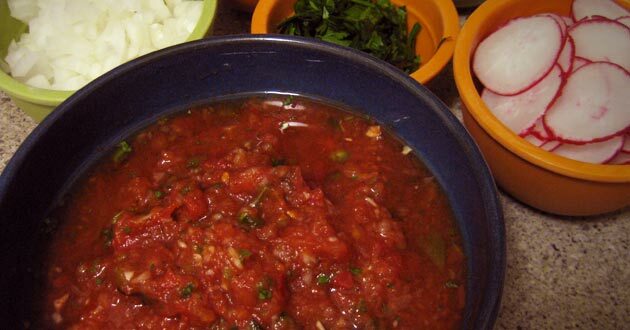 Do you use salsa as a way to doctor up a dull meal? Tell me in the comments! I cook with salsa a lot, but if it’s in my fridge, I’m gonna buy a bag of chips because that duo is just too perfect. I have a sort of masochistic fondness for Xochitl chips, which are altogether too expensive and so fragile you’d swear they were made out of spun sugar. They’re lousy for a hearty salsa or guacamole, because they shatter into a thousand pieces, but they make a perfect pairing with a smooth, light one. This recipe is more akin to the not-too-chunky red tomato salsa you get in Mexican restaurants in the States. Make this for a gathering and watch the wave of “holy cow, you made this?” pass over your guests. Oh, and a warning: Smart cooks wear rubber gloves when they handle hot peppers like jalapeños and poblanos. I’m not a smart cook, so I usually forget, but then I spend the rest of the night reminding myself not to touch my eyes. No matter how many times you wash your hands, those pepper oils’ll getcha. If you’re a contact lens wearer, be smarter than I usually am or get a buddy to do the pepper prep. I promise it’s worth it. Using long metal tongs, hold poblano over the flame of a gas burner, turning to char evenly on all sides. When pepper is charred (about 5 minutes), place in a glass bowl and cover tightly with plastic wrap or a snug-fitting plate. Let rest 10 minutes. Rub charred skin off poblano with your hands or a dry paper towel and discard it. Slice pepper open, discard stems and seeds, and roughly chop flesh. Heather, this recipe is great! We made it last night but tried it using fresh tomatos and poblano pepper roasted on the grill instead of canned stuff. It turned out delicious!! I’m so happy to hear it! Yeah, when fresh tomatoes are available, it’s worth using them for sure. Did you cook them at all first or chop them up fresh? Either way is delicious. I find the canned tomatoes are a large part of what makes this recipe taste restaurant-style (given that kind of salsa is often either heated or canned, so the tomatoes take on a different texture), but MAAAAAN do I love salsa fresca, and it’s such a great treat with seasonal produce! (And I’m totally envious of your grill.) Thanks for reporting back! You’re the first person to cook one of my recipes from this blog. I don’t mind telling you, I’m finding it extremely gratifying. Jesse & I like this kind of salsa on scrambled eggs & quiche. It is really yummy. Going to try your recipe. Only problem I have is the cilantro—have an allergy to it—so I usually use parsley, which changes the taste just a little. Vi, I loooove salsa on eggs. I make a great quick quiche I’ll be posting here some time that practically demands salsa as a topping. Salsa makes simple foods feel special, I think! When I made this for our Cinco de Mayo gathering, I used only a very small amount of cilantro (just a 1/4 cup, spread over 7 cups of salsa) because I was going to be serving someone who is cilantro-averse. As I’d hoped, she didn’t mind its presence. (The proof is below — Lauren is my cilantro-hating pal!) For a true allergy, obviously you should omit it entirely, and while the flavor profile would change slightly, I think it’d still be tasty! Let me know how it goes. I ate this salsa, and it was amazing! Make it people…then invite me over! You can jam on my salsa any time, girl.